Only in Ogunquit, Maine can you snow shoe along the ocean! 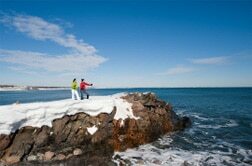 One of the most unspoiled activities to enjoy in Ogunquit is a snow shoe along the Marginal Way footpath. As the town does not plow it, it becomes a haven for those outdoor enthusiasts looking for the beauty of the seaside enjoyed in the serenity of the quiet winter season. With the snow we have received during the 2015 winter, the path is covered and deep, making snow shoes mandatory to walk the path. Sit on a bench along the way and take in the magnificent ocean views while after you come back to the Inn for a hot drink or lunch before you soak in the hot tub. If you’re staying in town while it snows, another fun activity you can tell you friends about is snow shoeing the beach. Enjoy fresh snow and a beach day all at the same time. Walk the deeper snow along the fence line of the dunes, or ditch the snow shoes during your walk to find sand dollars on the beach during low tide. You’ll be all by yourself on Maine’s prettiest beach.